Last month, U.S. District Court Judge Richard Story in Atlanta certified a class action by participants in the SunTrust Banks, Inc. 401(k) Savings Plan. According to the Judge, the class proposed by the plaintiffs “will help bring an efficient resolution to this case.” The class is composed of an estimated 50,000 individuals who were participants or beneficiaries of SunTrust’s pension plan. One person’s efficiency, however, is another person’s headache. In this case, the headache is suffered by the Plan’s trustees who manage its investment decisions. Here’s the background. The lawsuit was filed in 2008 alleging that bank executives and members of SunTrust’s board of directors breached their duties as Plan fiduciaries by continuing to offer SunTrust stock as a retirement investment and a 401(k) “match” long after they became aware that the bank’s stock was tanking due to massive losses in the bank’s mortgage portfolios. In the complaint, plaintiffs allege that the bank executives responsible for overseeing the retirement plan breached their fiduciary duties by approving investments in SunTrust stock at the same time that the stock was losing 64% of its value. 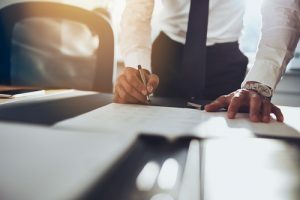 Under ERISA, the federal statute that governs group pension plans, in making investment decisions, plan trustees are subject to the duties of loyalty and prudence. Loyalty requires a fiduciary to act solely in the interest of plan participants and beneficiaries. Prudence requires the fiduciary to act with “the care, skill, prudence, and diligence” that a prudent person in the same circumstances would exercise. That means that plan fiduciaries are required to make wise investments and monitor investments to remove imprudent ones. The SunTrust case illustrates how seriously plan trustees who make investment decisions must take their responsibilities. If you are a responsible fiduciary, make sure your investment policy is properly crafted and implemented. As part of my practice, I advise pension plans and their trustees. If you have a question, call me. Theodore P. Stein is an attorney based in Bethesda with more than 30 years of experience who counsels employers, their plans and plan trustees on how to comply with ERISA and the ACA and how to minimize the risk of ERISA claims. He also represents them when litigation is threatened or filed. He is the Chair of the ERISA/Employee Benefits Practice and a Principal in the firm’s Labor and Employment Practice Group.